For over 50 years ! 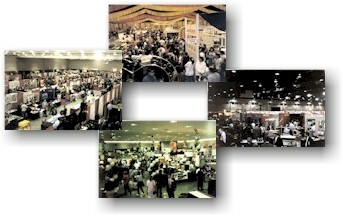 Throughout Mid-America Expositions’ 50 year history, the Late Bob Mancuso, Sr., developed many successful events, trade shows and expositions throughout the Midwest in several markets including Agriculture, Home & Garden, Business & Industrial which have become regarded as some of the finest presentations in the United States. Today his three sons, Bob, Joe, and Mike carry on his Legacy . Mid-America Expositions, Inc. is also very involved with producing and/or promoting several civic activities, sporting and special events throughout the Omaha Area. Some of these include Taste of Omaha, Nebraska Balloon & Wine Festival, Omaha Health, Wellness & Fitness Expo – Mind Body & Spirit Fair, Corporate Cycling Challenge Bike Ride, Midwest Grand Fondo, Omaha Biathlon, the Outland Trophy Award Dinner, Outland Finalist Announcement Reception Party, and the Greater Omaha Scholar Athlete Awards Luncheon. As well as some of these past Events like the Big Eight Women’s Volleyball Championships, County Fairs, Disney On Parade, Harlem Globetrotters, Omaha Racers, KC – Omaha Kings, Ringling Brothers and Shrine Circuses, Sesame Street Live, Septemberfest, WestFair, NBA Exhibition Games, Japan – USA Games, and US Hot Rod Association Truck and Tractor Championships, to name a few.